This species has not been recorded from any protected areas. If subpopulations can be located, the population size should be determined and the site protected. Surveys are needed to determine whether or not this species still survives in the wild. Taxonomic research is also required to verify whether this is a valid, distinct species (Indonesia Red List Assessment Workshop May 2017). This species is known only from Mount Ungaran, Central Java, Indonesia. The elevational range of this montane forest species is unknown. It is known only from the holotype, and has not been recorded for over 100 years, so there is a possibility it is already extinct (particularly if it is genuinely confined to the type locality). 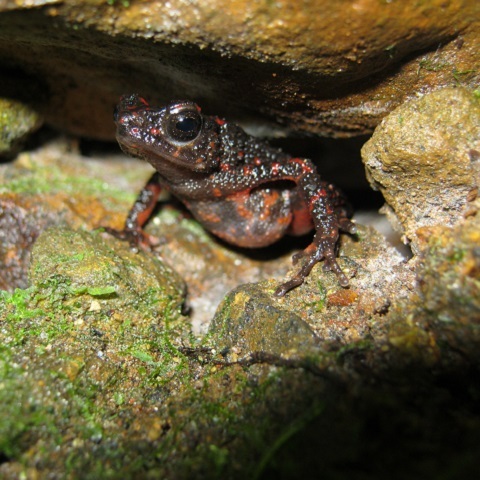 In 2010, surveys were conducted at type locality as part of the Lost Frogs initiative, but failed to record this species, and multiple surveys carried out every two months by the University Negeri Semarang since then have also failed to record it (M. Kusrini and M. Munir pers. comm. May 2017). From this lack of records, it is reasonable to infer that this species has a very small population which is suspected to be fewer than 50 mature individuals. Furthermore, if the population is still extant, it is suspected to be decreasing due to ongoing decline in the extent and quality of habitat. There is almost no forest remaining at Mount Ungaran. Much of the forest at the type locality has been converted to a tea plantation and into other agricultural uses (Indonesia Red List Assessment Workshop May 2017).